(C) 2014 Andrés G. Morales-Núñez. This is an open access article distributed under the terms of the Creative Commons Attribution License (CC BY 4.0), which permits unrestricted use, distribution, and reproduction in any medium, provided the original author and source are credited. Paratanais rosadi sp. n. described from Puerto Rican coastal waters represents the first species of the genus from the northwestern Atlantic. It is distinguished from the other Paratanais species by a combination of characters, including article-2 of the maxilliped palp with a geniculate, finely-serrulate seta on inner margin; chela with stiff, geniculate, seta arising from propodus between fixed finger and dactylus and with short, stout, finely serrulate, seta on inner distal face of propodus adjacent to base of dactylus; carpus of pereopods 4−6 having three, instead of four stout modified spiniform setae distally, uropodal exopod distinctly shorter than endopodal article-1; and uropodal endopod with articles of about of equal in length. A key for the separation of Paratanais species from the Atlantic Ocean is presented. Morales-Núñez (2011) have summarized the information on the crustacean order Tanaidacea presently known from Puerto Rico. They recorded a species belonging to the genus Paratanais Dana, 1852 from the waters off Culebra Island. Subsequently, additional specimens of this species were collected from La Parguera on the southwestern coast of Puerto Rico. After further examination it was determined that it represented and undescribed species. The description of this species is the subject of this paper. The status of genus Paratanais was recently partially reviewed by Bird and Bamber (2013). Based on differences in the setation of the maxilliped, chela, and pereopods, they transferred five species, (i.e. Paratanais denticulatus Gutu & Ramos, 1995; Paratanais intermedius Dojiri & Sieg, 1997; Paratanais malignus Larsen, 2001; Paratanais spinanotandus Sieg, 1981; and Paratanais vicentetis Larsen, Nagaoka & Froufe, 2012) to the new genus, Aparatanais Bird & Bamber, 2013. Further they described four new species of Paratanais (i.e. Paratanais caterae Bird & Bamber, 2013; Paratanais hamulus Bird & Bamber, 2013; Paratanais incomptus Bird & Bamber, 2013; and Paratanais puia Bird & Bamber, 2013) from New Zealand waters. Paratanais coelhoi Araújo-Silva & Larsen, 2012 described was not treated by Bird and Bamber (2013). Twenty-seven nominal species are currently attributed to the genus Paratanais (Anderson 2013; WoRMS). At present, seven species have been reported from the Atlantic Ocean. Three of these species Paratanais hessleri Kudinova-Pasternak, 1985; Paratanais martinsi Bamber & Costa, 2009; and Paratanais pseudomartinsi Larsen, 2012, are known from their respective type localities in the NE Atlantic, and a single species, Paratanais elongatus (Dana, 1849) is reported from the NW Atlantic (Bamber and Costa 2009, Larsen 2012, Kudinova-Pasternak 1985; Makkaveeva 1968). Three of these species are reported from the South Atlantic, Paratanais euelpis Barnard, 1920 from the SE Atlantic and two, Paratanais coelhoi Araújo-Silva & Larsen, 2012 and Paratanais oculatus Vanhöffen, 1914, from the SW Atlantic (Araújo-Silva and Larsen 2012, Barnard 1920, Silva-Brum 1973). Of the three NE Atlantic species, Paratanais hessleri is the most poorly known. Its type material is based on single incompletely described and illustrated female specimen collected on the slope of the Great Meteor Seamount. The other SE Atlantic species, Paratanais martinsi and Paratanais pseudomartinsi, which were both described from the Azores, are quite similar morphologically (Larsen 2012). Makkaveeva (1968) reported Paratanais elongatus as “Leptochelia [=Paratanais] elongatus (Dana, 1849)” from Cuban waters; however, Bamber (1998) suggested that her “poorly figured” specimens might have more affinities with the South African Paratanais euelpis. Additionally, Heard et al. (2004) reported “Paratanais sp. A” from Florida waters including Port Everglades, Florida Keys (Long Key), and Florida West Coast (Tampa Bay) and they suggested that the Cuban specimens reported by Makkaveeva might be conspecific with the one found by them in South Florida material. From the equatorial Southwest Atlantic, Silva-Brum (1973) reported Paratanais oculatus (Vanhöffen, 1914) from Brazilian coastal waters; this species was previously known from Sub-Antarctic waters (Vanhöffen 1914; Shiino 1978). Silva-Brum’s identification, however, was questioned by Araújo-Silva and Larsen (2012), who described Paratanais coelhoi from the same general locality. The remaining South Atlantic species, Paratanais euelpis, was briefly described from the Southwest coast of South Africa (Barnard 1920) and later redescribed in detail by Lang (1973). Part of the material was diver-collected during 2002 using PVC corers at a depth of 28 m off Culebra Island (eastern Puerto Rico). During 2008 larger series of specimens, including the type material was collected with a benthic grab at a depth of 14.9 m near Margarita Key in the southwestern region of La Parguera Natural Reserve (Fig. 1). Samples were processed using the methods described by Morales-Núñez and Kornicker (2007) and Morales-Núñez et al. (2010). 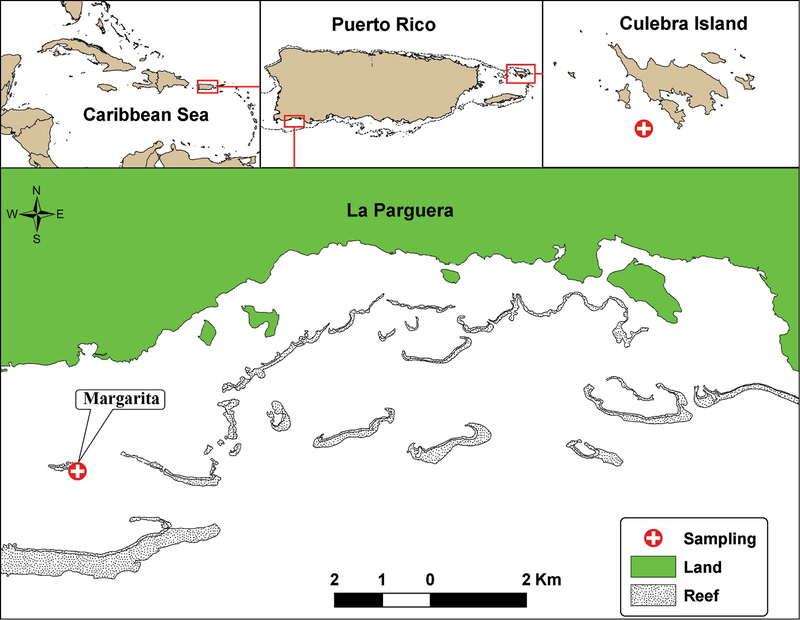 Geographic location of La Parguera, Southwest Puerto Rico, and Culebra Island, Eastern Puerto Rico, indicating the sampling stations where Paratanais rosadi sp. n., were found. Type material has been deposited in the National Museum of Natural History, Smithsonian Institution, Washington DC, (USNM), and the Gulf Coast Research Laboratory Museum, Ocean Springs, Mississippi MS, (GCRL). All measurements are in millimetres (mm). Total body length (TL) is measured from the tip of the rostrum to the end or tip of the telson. The terminology used in this paper, unless otherwise stated, follows that of Larsen (2003). Abbreviations: TL = total length; millimetres = mm. Paratanais elongatus Dana, 1849 (see Bamber 1998). See Bird and Bamber (2013). Holotype: adult female (USNM 1231351), 17°55'57.70"N, 67°06'53.36"W, Margarita Southwest of La Parguera, Puerto Rico, depth 14.9 m, collected on August 1 of 2008. Paratypes: one male (USNM 1231352), two females (USNM 1231353); two females, (GCRL 6529), the same collection data as for holotype. Additional specimens from the type locality are in the collection of the authors. Female. Pleon shorter than pereonites 5−6 combined. Antennule with cap-like terminal article. Antenna article-2 with length twice depth in lateral aspect, ventral marginal sub-linear, lacking shallow apophysis, small simple seta subdistally. Maxilliped palp article-2 with inner margin bearing geniculate, finely-serrulate, seta. Chela with propodus having geniculate, narrow, stiff, seta arising at inner base of fixed finger adjacent articulation with dactylus and extending distally: inner face with small, short, stout, finely serrulate seta on inner distal face of propodus adjacent to base of dactylus. Pereopods 4−6 having carpus distally with three modified, stout spiniform setae and small simple seta. Uropodal exopod uniarticulate, length about twice width, and shorter than endopodal article-1; endopod with both articles about same length. Male. Small, length about 1.2 mm. Carapace length about equal to that of first three pereonites combined; eyes large with diameter about half length of carapace. Pereonites 4−5 slightly longer than pereonites 1−3, and 6. Pleonites as long as pereonites 2−5 combined length. Antennule peduncle article about 1.3 times as long as wide; antennular flagellum with four-articles, without detectable terminal cap-like article; flagellum article-2 shorter than articles 3−4 combined. Uropod endopod bi-articulated. This species is named in honour of Marcos Rosado Ruiz who has instrumental in assisting the senior author in collection of the specimens used in this study. Body (Fig. 2A). Length about 2.8 mm, about 12.5 times width. Paratanais rosadi sp. n., holotype female: A dorsal view B lateral view C enlargement of articulated setulate seta on pleonite-1. Scale bar A–B 1.0 mm. Carapace (Fig. 2A). About 15% TL and about twice length of pereonite-1. Ocular lobes with eyes, visual elements present, with demarked lines on carapace indicating possible union of lateral plates. Pereon (Fig. 2A). About 65% of TL, pereonite-1 shorter than other pereonites; pereonites 2−6 subequal in length; all pereonites subrectangular; all pereonites wider than long. Pleon (Figs 2A‒C). About 15% TL, shorter than pereonites 5−6 combined; pleonites-1 and -5 of nearly equal lengths, distinctly wider than long, slightly larger than others pleonites; pleonites 2−4 subequal; pleonites 1−4 each with pair of swollen lateral, setulose setae (Fig. 2C); pleonite-5 with lateral pair of short simple setae (Fig. 2B). Pleotelson (Figs 2A, 4F). About 5% TL, longer than pleonite-5, with four simple setae distally. Antennule (Fig. 3A). Slightly shorter than carapace. Article-1 length about 2.4 times width, two broom-setae laterally on mid-dorsal margin and simple seta distally on mid-dorsal margin. Article-2 length about third that of article-1, one simple seta on dorsodistal margin, and one simple and one broom-seta disto-ventrally. Article-3 with length about 1.5 times width, dorsal and ventral seta on distal margin. Article-4 elongate, equal length of article 2−3 combined, distally with broom-seta and long simple seta. Small, terminal, cap-article with aesthetasc and four simple setae of varying length. Paratanais rosadi sp. n., holotype female: A antennule, lateral view B antenna, lateral view C enlargement of tip of the antenna D labrum E left mandible F lacinia mobilis G right mandible H labium. Scale bar A–G 0.1 mm. Antenna (Figs 3B‒C). Article-1 greatly reduced (not illustrated). Article-2 length about 1.4 times depth, ventral margin sub-linear with small simple seta subdistally; dorsal margin with long simple seta distally. Article-3 slightly wider than long, with strongly developed, stout disto-dorsal spiniform seta. Article-4 about three times width, with two short simple setae on middle-distal margin and two broom-seta on distoventral margin. Article-5 with disto-dorsal simple seta. Article-6 minute, with one articulated cluster of one small curved seta and three long setae, and single articulated seta (Fig. 3C). Mouthparts. Labrum (Fig. 3D). Hood-shaped, distal edge finely setose. Mandibles (Figs 3E‒G): molar process well developed; left mandible with smooth, strong incisor without crenulate upper margin, lacinia mobilis sub-triangular with four to five shallow subdistal denticles (Figs 3E–F); right mandible (Fig. 3G) with strong crenulate incisor and weakly bifid tip. Labium (Fig. 3H): with two lobes, inner lobe finely setose distally, with minute spiniform seta on outer distal margin. Maxillule (Figs 4A‒B): endite with nine distal spiniform setae, outer margin with short simple setae; palp with two long terminal setae of unequal length (Fig. 4B). Maxilla (Fig. 4B): subovally elongate. Paratanais rosadi sp. n., holotype female: A maxillule B maxillule and maxilla C maxilliped D enlargement of palp article-2 E pleopod F enlargement of plumose seta, with whip-like tip G uropod. Scale bar A–F 0.1 mm. Maxilliped (Figs 4C‒D). Basis fused, long seta near articulation with palp extending distally to or near distal margin of endites; endites fused medially in proximal third, inner lobes with distal margin bearing seta and two medial flat tubercles, inner lobes serrate on outer-distal margin. Palp: article-1 naked; article-2 triangular with simple seta on outer proximal margin, inner margin with two simple setae and geniculate, finely-pectinate (visible at magnification 100×), spiniform seta (Fig. 4D); article-3 with three setulose setae on inner margin; article-4 with four (three setulose and one simple) setae on distal margin, simple seta on outer margin, and two or three simple setae on inner margin. Epignath: not recovered. Cheliped lateral aspect (Figs 5A–C). Sclerite sub-triangular, dorsally inserted, naked. Basis length about 2.1 times width, simple seta on disto-dorsal margin. Merus triangular, with simple seta on mid-ventral margin. Carpus length 1.8 times width, with two (one proximal and one distal) short simple setae on dorsal margin, and two ventral simple setae on subdistal, ventral margin. Chela (lateral aspect) (Figs 5A−C): propodus length 1.4 times width; fixed finger with two ventral seta and three simple setae on incisive margin adjacent; stiff, geniculate, seta arising from propodus between fixed finger and dactylus, extending distally between fixed finger and dactylus. Dactylus slightly longer than fixed finger, curved distally, unguis not fused. Chela (Inner aspect) (Fig. 5D): Propodus with short setulate seta distally near articulation of dactylus. Dactylus with short setulate seta proximally on inner sub-dorsal margin. Paratanais rosadi sp. n., holotype female: A right cheliped, lateral view B enlargement of propodus and dactylus of right cheliped, lateral view C propodus and dactylus of left cheliped, lateral view D propodus and dactylus of left cheliped, inner view. Scale bar A, C and D 0.1mm. Pereopod-1 (Figs 2B, 6A). Longer than other five pereopods. Coxa with simple seta (Fig. 2B). Basis slender, length about 3.8 times width, with dorso-proximal simple seta. Ischium about three times width with single simple ventral seta. Merus length about 2.1 times width, with two ventro-distal small simple setae. Carpus with length about 2.1 times width, one short and one long disto-dorsal simple setae and one ventro-distal simple seta. Propodus with length about 4.5 times width, with two sub-distal simple setae on dorsal margin and one sub-distal seta ventrally. Dactylus and unguis combined about as long as propodus, with simple proximal seta, unguis longer than dactylus. Pereopod-2 (Figs 2B, 6B). Coxa with simple seta (Fig. 2B). Basis length about 2.7 times width, with supraproximal seta. Ischium length about 3.0 times width, with simple ventral seta. Merus length about 1.5 times width, with simple seta and one spiniform seta, disto-ventrally. Carpus length about 1.8 times width, with one longer disto-dorsal spiniform seta and two disto-ventral spiniform setae. Propodus length about 5.1 times width, with two sub-distal simple setae on dorsal margin and one sub-distal simple seta ventrally. Dactylus and unguis together longer than propodus and not fused, with simple proximal seta, unguis longer than dactylus. Paratanais rosadi sp. n., holotype female: A pereopod 1 B pereopod 2 C pereopod 3 D pereopod 4 E pereopod 5 F pereopod 6 G enlargement of bifurcate spiniform setae. Scale bar A–F 0.1 mm. Pereopod-3 (Fig. 6C). Similar to pereopod 2, except basis longer. Merus, carpus and propodus wider. Pereopod-4 (Figs 6D, G). Basis stout, length about twice width, with simple seta and two broom setae on mid-ventral margin. Ischium length about 6.5 times width, with two ventral simple setae. Merus length about 1.9 times width, with two short asymmetrical bifurcate spiniform setae on disto-ventral margin (Fig. 6G), and row of setules on distal half of ventral margin. Carpus length about 1.5 times width, distally with simple disto-ventral seta, and three stout modified spiniform setae (two asymmetrical bifurcate and one bipinnate spiniform seta), with row of setules on distal half of ventral margin. Propodus length about 2.6 times width, with mid-dorsal broom seta and disto-dorsal spiniform seta, with two bipinnate spiniform setae on distoventral margin, with distal row of setules. Dactylus and unguis claw-like, together almost half length of propodus, dactylus longer than unguis, curved and not fused. Pereopod-5 (Fig. 6E): Similar to pereopod-4, except basis without simple setae on mid-ventral margin. Pereopod-6 (Fig. 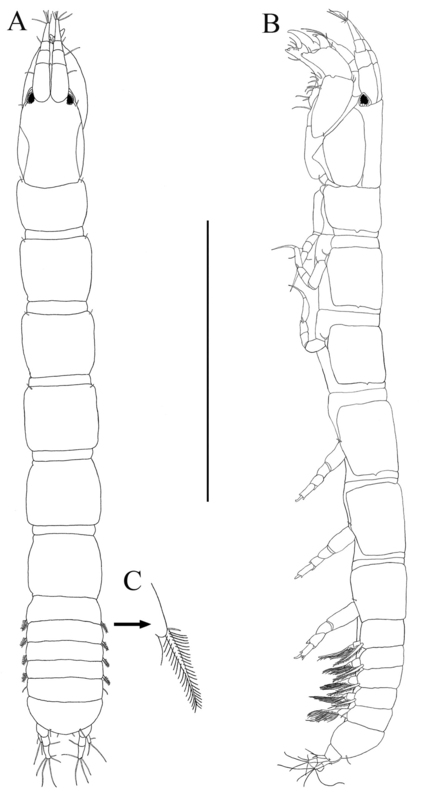 6F): Similar to pereopod-5, except basis length about 2.3 times width with two simple setae on mid-ventral margin. Propodus with four short spines on dorsal margin and without mid-dorsal broom seta, with three pectinate distal spiniform setae. Dactylus and unguis together about 1/3 length of propodus. Pleopod (Figs 4E−F). Five similar, well-developed, biramous pairs. Basal article broad, naked. Rami lengths slightly more than twice width; proximal plumose seta on distal inner margin adjacent to articulation with basis. Endopod with inner and distal margins bearing ten long plumose setae, distal most seta modified with whip-like tip (Fig. 4F); sub-distal lateral margin with seta modified with whip-like tip. Exopod with inner and distal margins bearing about 15 long plumose setae, outer margin naked. Uropod (Fig. 4G). Biramous, basis naked. Exopod uniarticulate, shorter than endopod article-1, with simple seta on mid-outer margin, and two simple setae (outer longest) on distal margin. Endopod biarticulated, article-1 as long as peduncle, with one simple and two broom setae on inner distal margin; article-2 length about subequal to length of article-1, with five simple and one broom setae on distal margin. Body (Figs 7A–B). Length about 1.20 mm, about 4.8 times as long as wide, smaller than female. Paratanais rosadi sp. n., paratype male: A dorsal view B lateral view. Scale bar A–B 1.0 mm. Carapace (Fig. 7A). About 20% TL, nearly as longer as wide; quadrate; naked; as long as pereonites 1 to 3 combined; ocular lobes bearing large darkly pigmented, multifaceted eyes, diameter about half length of carapace and about eight times that of female eye. Pereon (Fig. 7A). Slightly over 40% TL, pereonites sub-rectangular, and wider than long; pereonites 1 to 4 progressively longer; pereonite-5 about equal in length to pereonite-4; pereonite-6 shorter. Pleon (Fig. 7A). About 30 % TL, as long as pereonite 2−5 combined; all pleonites subequal. Antennule (Fig. 8A). With seven articles. Article-1 length about 1.3 times width, with four setae (1 simple and 3 broom) close to the middle of dorso-lateral margin, and with two broom setae on ventro-lateral subdistal margin. Article-2 length about 1.5 times width, with long disto-dorsal simple seta, and one simple and three broom on ventro-lateral distal margin. Article-3 with long disto-dorsal simple seta and small simple lateral seta. Article-4 with dense proximal group of aesthetasc ventrally. Article-5 length about 2.5 times width and with disto-ventral row of aesthetasc. Article-6 length about 2.7 times width, with disto-ventral row of aesthetascs. Article-7 length about 2.8 times width, with one long, one small, one broom setae and one aesthetasc, distally. Paratanais rosadi sp. 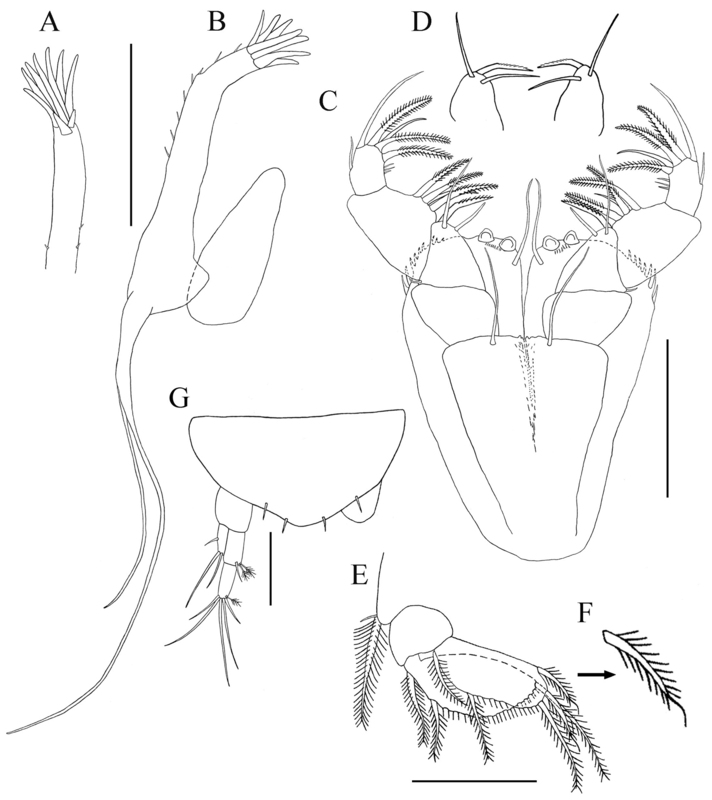 n., paratype male: A antennule, lateral view B antenna, lateral view C propodus and dactylus of right cheliped, inner view D uropod. Scale bar A‒D 0.1 mm. Antenna (Fig. 8B). Article-1 length about 1.1 times width. Article-2 length about 1.4 times width, with large disto-dorsal simple seta and simple seta on sub-distal lateral margin. Article-3 little wider than long, with large disto-dorsal simple seta. Article-4 length about 2.6 times width, with broom seta on mid-ventral margin and two long simple setae on disto-ventral margin. Article-5 elongate about 5.0 times as long as wide, with dorso-distal simple seta and simple seta on sub-distal ventral margin; article-6 tiny and with four (three long and one short) simple setae. Cheliped lateral aspect (Figs 7B, 8C). Slightly longer than that of the female. Basis length about twice width. Carpus length 1.5 times without short simple setae on dorsal margin. Propodus with length 1.6 times width. Inner face (Fig. 8C). Propodus 1.6 times as long as wide; with inner face having “comb row” of ten stout setae just proximal to articulation with dactylus (movable finger); fixed finger with strong spine distally, two simple setae ventrally, three simple setae on outer incisive margin, and single simple seta near articulation of dactylus. Dactylus longer than fixed finger, distally curved and unfused; single dorso-proximal simple seta on inner margin. Pereopod-1 (Fig. 9A). Longer than other pereopods. Similar to that of female, except for basis, carpus, and propodus longer. Ischium naked. Propodus with dorsal and ventral margin crenulate. Dactylus and unguis combined shorter than propodus; unguis slightly longer than dactylus. Paratanais rosadi sp. n., paratype male: A pereopod 1 B pereopod 2 C pereopod 4 D pereopod 6 E enlargement of tip of the unguis. Scale bar A‒D 0.1 mm. Pereopod-2 (Fig. 9B). Similar to pereopod-1, except for merus, carpus, propodus, and dactylus shorter. Pereopod-4 (Fig. 9C). Basis a little wider than in pereopods 2–3, appearing naked, length about 3.2 width. Ischium length about 3.0 times width, with two ventral simple setae. Merus length about 1.9 times width, with two short spiniform setae, disto-ventrally. Carpus length about 2.3 times width, with simple disto-dorsal seta and three spiniform setae. Propodus length 3.3 times width, with one spiniform seta on dorsal and ventral distal margin, with dorsal and ventral margin crenulate. Dactylus and unguis combined shorter than propodus; dactylus much longer than unguis, not fused. Pereopod-5 (not figured). Similar to pereopod–4. Pereopod-6 (Figs 9D–E). Similar to pereopod-4, except for propodus with three pectinate distal spiniform setae. Dactylus and unguis together longer than propodus, dactylus longer than unguis, tip of unguis bifid (Fig. 9E). Pleopod (not figured). Five similar, but more strongly developed than in female with longer natatory setae. Endopod with inner and distal margins bearing eleven long plumose setae, distal most seta modified with whip-like tip; sub-distal lateral margin with seta modified with whip-like tip. Exopod with inner and distal margins bearing about 12 long plumose setae, outer margin naked. Uropod (Fig. 8D). Similar to female, with minor qualitative differences in setation and all simple setae are longer than female. Currently know only from the type locality, at the depths from 15 to 28 m, on sandy substrata. Paratanais rosadi sp. 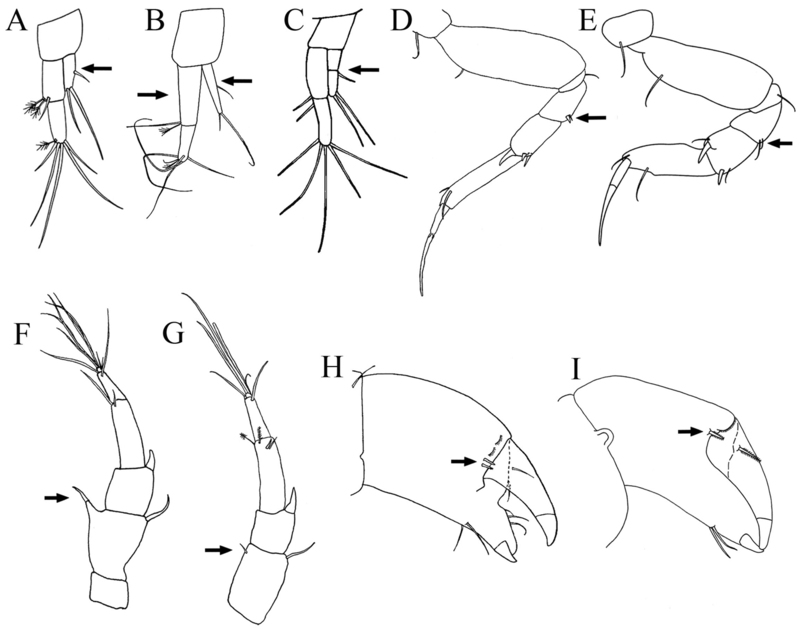 n., can be distinguished from the other previously described species by having carpus with only three distinct, modified, stout seta on pereopods 4−6; all others species have four distinct carpal spines. The female of Paratanais rosadi, appears most similar to the northeastern Atlantic species, Paratanais martinsi from the Azores and Paratanais euelpis from South African; Paratanais rosadi can be distinguished from Paratanais martinsi by (1) lacking a distinctly buttressed seta on antenna article-2; (2) having antennal article-2 with small simple seta on subdistal-ventral margin, not arising from apophysis or process; and (3) having uropodal endopod article-1 about same length as article-2. Owing to difficult in reliably distinguishing them, Paratanais martinsi and Paratanais pseudomartinsi are not separated in the Key to the Atlantic presented herein. Based on Lang’s detailed redescription of Paratanais euelpis, Paratanais rosadi differs from that species by the presence of a single small, short, setulate seta on the inner face of chela at the articulation with the dactylus, by having the endopodal articles about the same length; and by the stout exopod about twice as long as wide and being shorter than endopodal article-1. The new Puerto Rican species differs from the Brazilian species, Paratanais coelhoi by having (1) antennule article-1 being more elongate; (2) article-2 of the maxillipedal palp having inner margin with finely serrulate geniculate seta medially and two simple setae; and (3) merus of pereopod-2 with distinct spiniform seta on ventral margin. Bamber and Costa (2009) considered Paratanais hessleri from the mid-North Atlantic as a species incertae sedis. Based on the Kudinova-Pasternak’s (1985) illustrations, the presence of a biarticulate exopod distinguishes that deep-water species from Paratanais rosadi and so from the other Atlantic species of Paratanais. Although the description by Kudinova-Pasternak does not give details for the setation on pleonites 1 to 4, her illustration indicates the presence of only a simple seta on their pleura. Since all other known members of the genus Paratanais, with the possible exception of Paratanais oculatus sensu Shiino (1978), have swollen setulate setae present, her illustration is most likely incorrect. Notwithstanding, re-examination of Kudinova-Pasternak’s holotype and Shiino’s specimens is needed to clarify their status. Vanhoffen’s (1914) original description for Paratanais oculatus is brief and incomplete and his few illustrations lack detail. For the present we tentatively refer both Paratanais hessleri and Paratanais oculatus to the Paratanais. 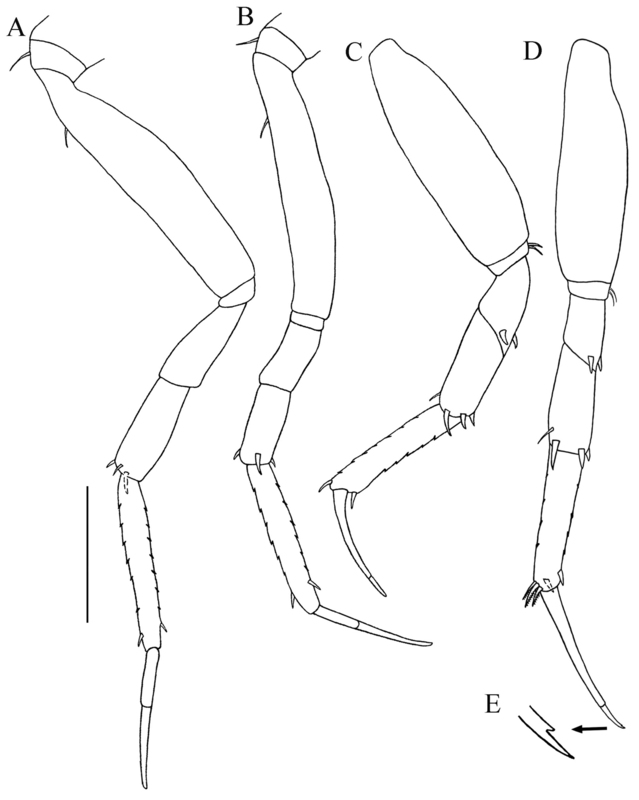 Based on Shiino’s (1978) description of Paratanais oculatus from Sub- Antarctic waters, the female of Paratanais rosadi can be distinguished from it by having (1) article-2 of the maxillipedal palp with finely serrulate and geniculate stiff seta and two simple setae (instead of four apparently simple setae) medially and (2) uropodal exopod composed of single article. In our opinion, no meaningful comparisons can be made using the descriptions provided for Paratanais oculatus sensu Silva-Brum (1973) from Brazil and Paratanais (=Leptochelia) elongatus sensu Makkaveeva (1968) from Cuba. Until the original material for these records can be re-examined or additional material from the localities in question made available for study, their occurrence in the Atlantic Ocean will remain highly suspect. Uropods: A Paratanais rosadi sp. n. B Paratanais euelpis C Paratanais hessleri. Pereopod-2: D Paratanais rosadi sp. n. E Paratanais coelhoi. Antenna: F Paratanais martinsi G Paratanais rosadi sp. n. Chela: H Paratanais euelpis I Paratanais rosadi sp. n. [Figures modified from: this study (A, D, G, and I); Lang 1973 (B and H); Kudinova-Pasternak 1985 (C); Araújo-Silva & Larsen 2012 (E); Bamber & Costa 2009 (F)]. Males are known only for 11 species of Paratanais (see Table 1). 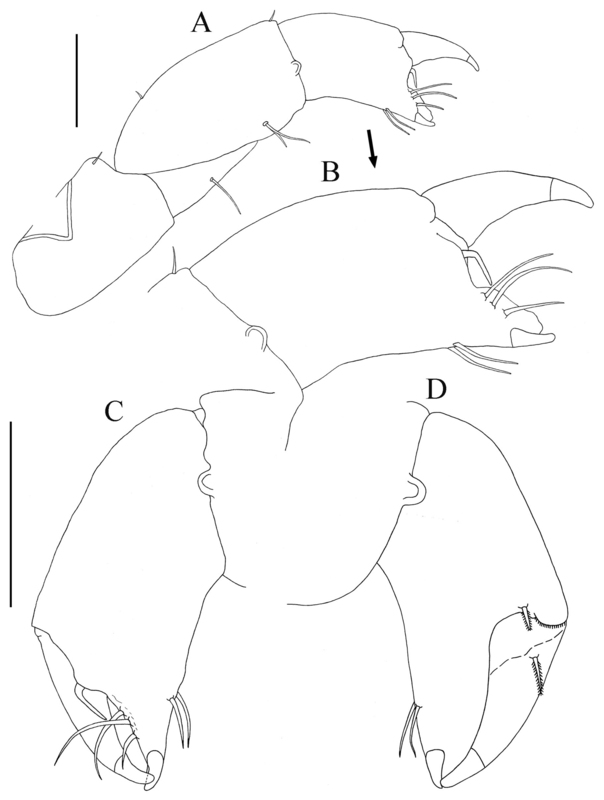 The male of Paratanais rosadi appears to be most similar to that of Paratanais clarkae Bird & Bamber, 2000 by having (1) large eyes occupying almost half the length of carapace and (2) antennule with seven articles. The male of Paratanais rosadi differs from Paratanais clarkae by having (1) a cheliped inner face having a “comb row” of ten small stout setae instead of 12; and (2) a cheliped dactylus without setae on the inner edge. The basis on the male antennule of Paratanais rosadi it is very similar to that of Paratanais puia, which also has an antennule with seven articles, but differs by (1) the proportions of the carapace; (2) the length of bases of the pereopods; and (3) having a shorter uropodal exopod. Alphabetical listing of the 23 currently recognized species for the genus Paratanais Dana, 1852, including information on distribution and depth range based on studies by Bird and Bamber (2000, 2013), Araújo-Silva and Larsen (2012), Anderson (2013), and a present study. Based on the questionable taxonomic status for five nominal species (i.e. Paratanais atlanticus Dollfus, 1897; Paratanais limicola Harger, 1878; Paratanais rigidus Bate & Westwood, 1868; Paratanais linearis Haswell, 1885; and Paratanais tenuis Thomson, 1880), we follow Sieg (1983) in considering them as species incertae sedis. Due to their inadequate descriptions and dubious taxonomic status, these five species are excluded from Table 1, which presents distribution and depth ranges for the 23 species of Paratanais sensu Bird and Bamber (2013) recognized or tentatively recognized herein. The specimens were collected as part of the Ph.D. dissertation of the senior author at the University of Puerto Rico, Mayagüez Campus. This research was supported by Puerto Rico Sea Grant College Program (PRSGCP). We thank participants for their help in collecting samples at Culebra Island. AGM-N thanks Puerto Rico Sea Grant College Program (PRSGCP) and Faculty of Arts and Sciences at University of Puerto Rico Mayagüez-Campus (UPRM), for providing financial support to work at the Gulf Coast Research Laboratory of the University of Southern Mississippi. Roger Bamber kindly clarified the current taxonomic status of the type species, Paratanais elongatus. The constructive and thoughtful comments of two anonymous reviewers were greatly appreciated; we take full responsibility for any differing systematic or taxonomic interpretations. We also thank to Michael Nemeth Feliciano (UPRM) for preparing Figure 1. Bamber RN (1998) Tanaidaceans (Crustacea, Peracarida) from the southeast of the South China Sea. Asian Marine Biology 15: 169−197. Bamber RN (2005) The tanaidaceans (Arthropoda: Crustacea: Peracarida: Tanaidacea) of Esperance, Western Australia, Australia. In: Wells FE, Walker DI, Kendrick GA (Eds) The marine flora and fauna of Esperance, Western Australia. Western Australian Museum, Perth, 613−728. Bamber RN (2008) Tanaidaceans (Crustacea: Peracarida: Tanaidacea) from Moreton Bay, Queensland. In: Davie PJF, Phillips JA (Eds) Proceedings of the Thirteenth International Marine Biological Workshop, The Marine Fauna and Flora of Moreton Bay, Queensland. Memoirs of the Queensland Museum-Nature 54(1): 143−218. Bamber RN, Costa AC (2009) The Tanaidaceans (Arthropoda: Peracarida: Tanaidacea) of Sao Miguel, Azores, with description of two new species, and a new record from Tenerife. Açoreana, Suplemento 6: 183−200. 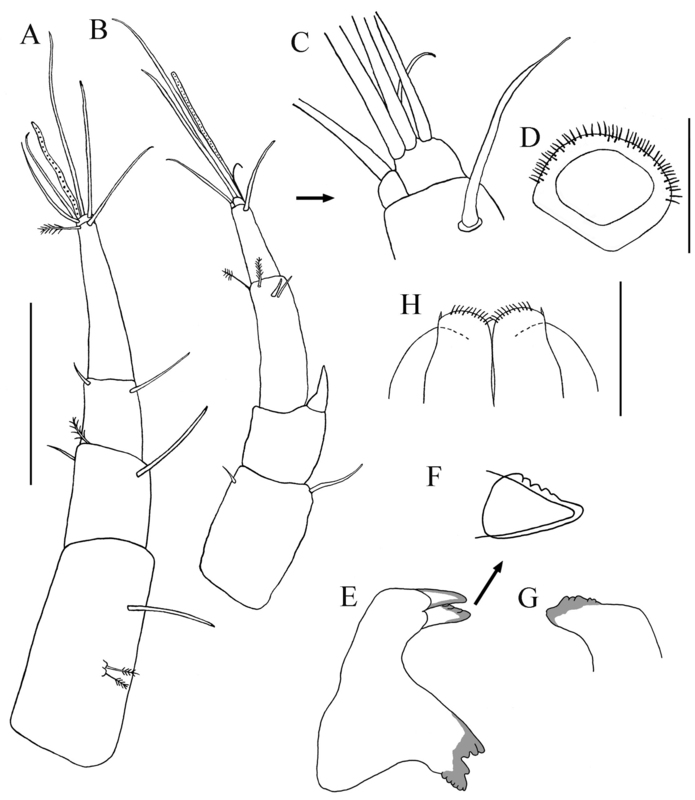 Barnard KH (1920) Contributions to the crustacean fauna of South Africa. 6. Further addition to the list of marine Isopoda. Annals of the South African Museum 17: 319−438. Bate CS, Westwood JO (1868) Order Isopoda. In: Bate CS, Westwood JO. A History of the British Sessile-Eyed Crustacea. J. van Voorst, London, 2: 99−154. Bird GJ (2011) Paratanaoidean tanaidaceans (Crustacea: Peracarida) from littoral and shallow sublittoral habitats in New Zealand, with descriptions of three new genera and seven new species. Zootaxa 2891: 1−62. Bird GJ, Bamber RN (2000) Additions to the Tanaidomorph tanaidaceans (Crustacea: Peracarida) of Hong Kong. In: Morton B (Ed) The Marine Flora and Fauna of Hong Kong and Southern China IV. Proceedings of the Tenth International Marine Biological workshop: The Marine Flora and Fauna of Hong Kong and Southern China. Hong Kong, 2–26 April 1998. Hong Kong University Press, Hong Kong, 66−104. Błażewicz-Paszkowycz M, Bamber RN (2012) The shallow-water Tanaidacea (Arthropoda: Malacostraca: Peracarida) of the Bass Strait, Victoria, Australia (other than the Tanaidae). Memoirs of Museum Victoria 69: 1−235. Dana JD (1849) Conspectus Crustaceorum. Conspectus of the Crustacea of the Exploring Expedition. American Journal of Science and Arts, Series 2(8): 424−428. Dana JD (1852) On the classification of the Crustacea Choristopoda or Tetrapoda. American Journal of Sciences and Arts, Series (2) 14: 197–306. Dojiri M, Sieg J (1997) The Tanaidacea. In: Blake JA, Scott PH (Eds) Taxonomic atlas of the benthic fauna of the Santa Maria Basin and western Santa Barbara Channel. Vol. 11. The Crustacea. 2. The Isopoda, Cumacea and Tanaidacea. Santa Barbara Museum of Natural History, Santa Barbara, 181−268. Dollfus A (1897) Note préliminaire sur les Tanaidæ recueillis aux Açores pendant les Campagnes de l’Hirondelle (1887−1888). Bulletin du Société Zoologique de France 22: 207−215. Guţu M, Ramos GE (1995) Tanaidaceans (Crustacea, Peracarida) from the waters of Colombian Pacific with the description of two new species. Travaux du Muséum d’Histoire Naturelle Grigore Antipa 35: 29−48. Harger O (1878) Descriptions of new genera and species of Isopoda, from New England and adjacent regions. American Journal of Science and Arts, Series 3 15(89): 373−379. Haswell WA (1885) A revision of the Australian Isopoda. The Proceedings of the Linnean Society of New South Wales 9: 1001−1015. Kudinova-Pasternak RK (1985) Tanaidacea (Crustacea, Malacostraca) collected on the summit and at foot of Great-Meteor Seamount. Zoologicheskii Zhurnal 120: 52−64. Kussakin GO, Tzareva LV (1972) Tanaidacea from the coastal zones of the Middle Kurile Islands. Crustaceana Supplement 3: 237−245. Lang K (1949) Contribution to the systematics and synonymics of the Tanaidacea. Arkiv för Zoologie 42: 1−14. 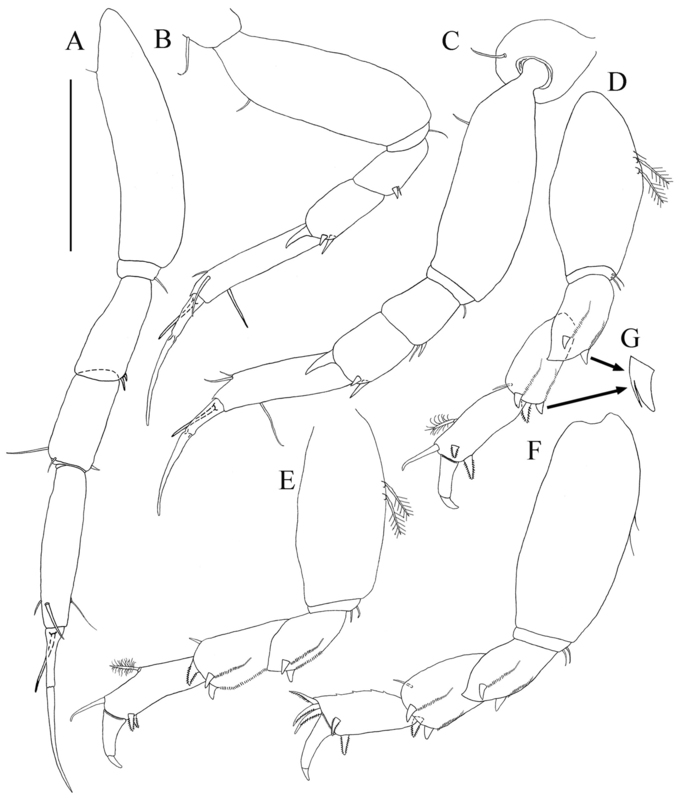 Larsen K (2012) Tanaidacea (Crustacea) from Macaronesia II. The deep-water fauna from the Azores archipelago, Portugal. Zootaxa 3250: 26−42. 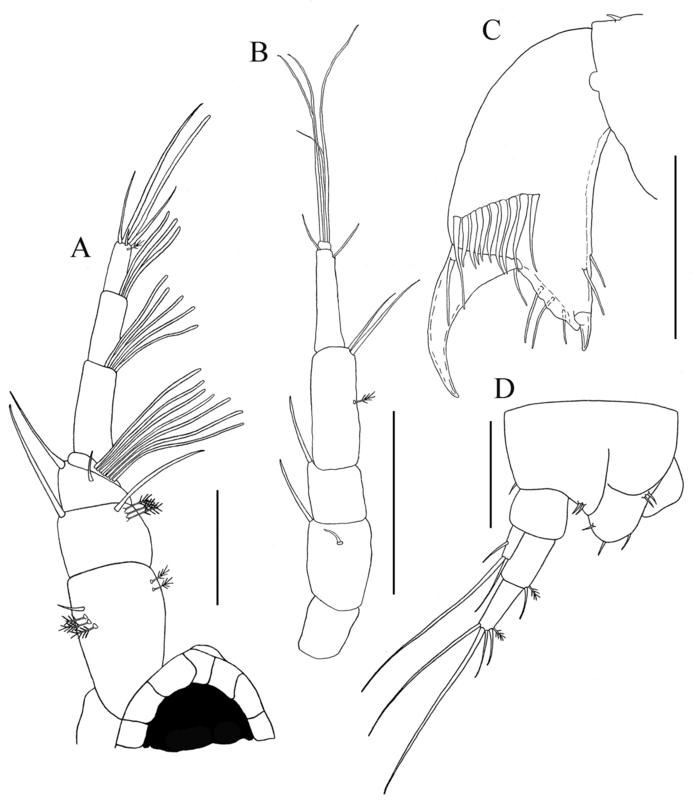 Larsen K, Nagaoka R, Froufe E (2012) Tanaidacea (Crustacea) from Macaronesia III. The shallow-water Tanaidomorpha from the Cape Verde archipelago. Zootaxa 3498: 24−44. Makkaveeva EB (1968) Vidovoi sostav i raspredelenie tanaidovykh i ravnonogih v pribrejnom raione o Kuba. Issledovanija Tzentral Amerikansk Morei, Naukova Dumka, Kiev, 2: 99−104. Makkaveeva EB (1971) Kachestvenniy sostav i kolichestvennoe raspredelinie tanaidovikh rakov v Krasnom More. In: Bentos Shelfa Krasnogo Moria. Naukova Dumka, Kiev, 211 pp. Morales-Núñez AG (2011) Tanaidaceans (Crustacea: Peracarida) from coastal waters of La Parguera and Culebra Island, Puerto Rico, with taxonomic observations. PhD Thesis, University of Puerto Rico, Mayagüez Campus, Mayagüez, Puerto Rico. Morales-Núñez AG, Heard RW, Alfaro M (2010) Saltipedis (Spinosaltipedis) puertoricensis, a new subgenus and species of apseudomorphan (Crustacea: Tanaidacea: Parapseudidae) from coastal waters off Culebra Island, Puerto Rico, with keys and taxonomic observations. Zootaxa 2578: 25−46. Shiino SM (1978) Tanaidacea collected by the French scientists on board the survey ship “Marion Defresne” in the regions around the Kerguelen Islands and other sub-Antarctic islands in 1972, ’74, ‘75, ’76. Science Report of Shima Marineland 5: 1−122. Sieg J (1980) Sind die Dikonophora eine polyphyletische Gruppe? Zoologischer Anzeiger 205: 401–416. 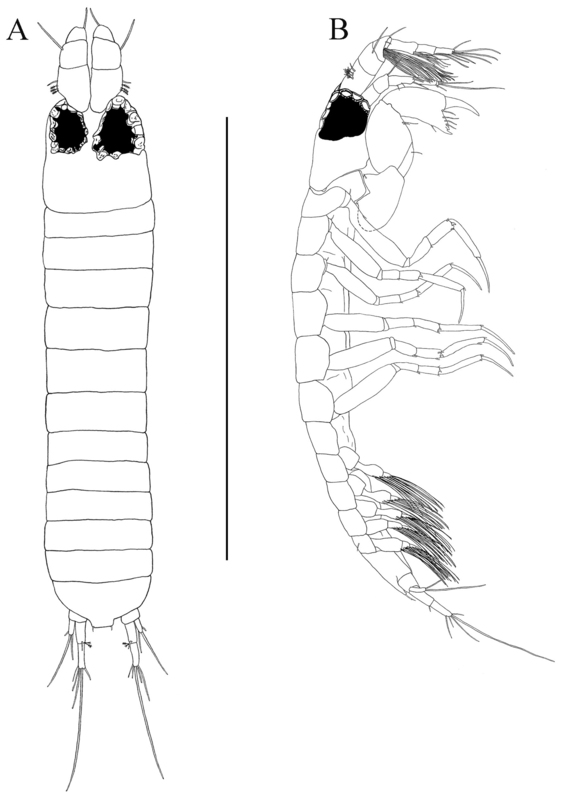 Sieg J (1981) A new species of the genus Paratanais (Crustacea: Tanaidacea), P. spinanotandus, from Seamount Vema. Proceedings of the Biological Society of Washington 94: 1271−1278. Sieg J (1983) Tanaidacea. Part 6. In: Gruner HE, Holthuis LB (Eds) Crustaceorum Catalogus. W. Junk, The Hague, 1−552. Silva-Brum IN (1973) Contribução ao conhecimento da fauna do Arquipélago de Abrolhos, Bahia, Brasil, Crustacea - Tanaidacea. Boletim do Museu de História Natural Da Universidade Federal da Minas Gerais. Zoologia 18(4): 1−25. Thomson GM (1880) New species of Crustacea from New Zealand. Annals and Magazine of natural History, London 5(31): 1−6. Vanhöffen E (1914) Die Isopoden der Deutschen Südpolar-Expedition 1901–1903. Deutsche Südpolar-Expedition. Zoologie 15: 447−598.